Laurie Wisbrun | Scarlet Fig: Success - Project Raincoat! 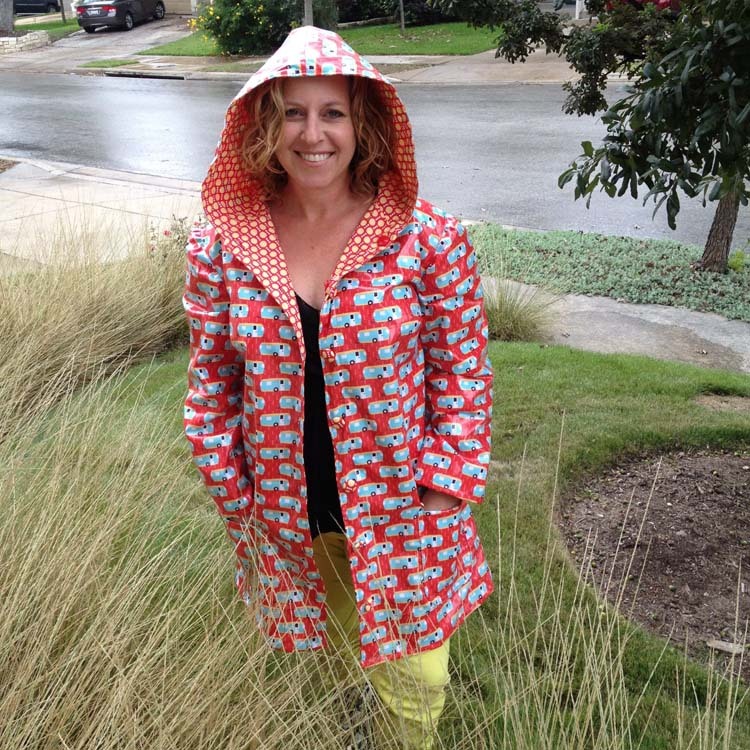 For those of you who follow me on Instagram (@lauriewis) or Flickr, you know I've been hard at work at making myself a new raincoat. When I found out that one of the designs in my upcoming fabric collection for Robert Kaufman called Roughing It was going to be printed on slicker fabric (eeeee! ), I set my sights on making myself something really special. The little campers are one my all time favorite designs and I really, really wanted a coat for myself out of the fabric. But frankly, as soon as the statement was out of my mouth, my inner voice piped up and said..."Are you nuts? That sewing project is so far beyond your sewing capabilities! There is no way you can pull that off." But with loads of encouragement from my online pals who convinced me to ignore that negative inner voice, I bit the bullet, ordered a copy of a super cute raincoat pattern from Amy Butler and started gathering up my supplies. And I'm so glad I did it. 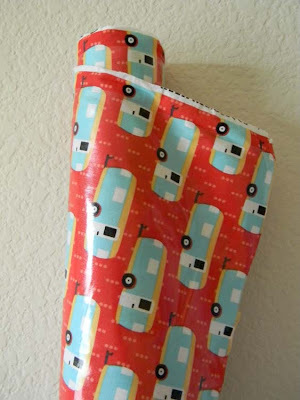 Amy also has a link to a page with some tips for sewing with laminated fabrics and it was a great help in getting everything prepared for my project. 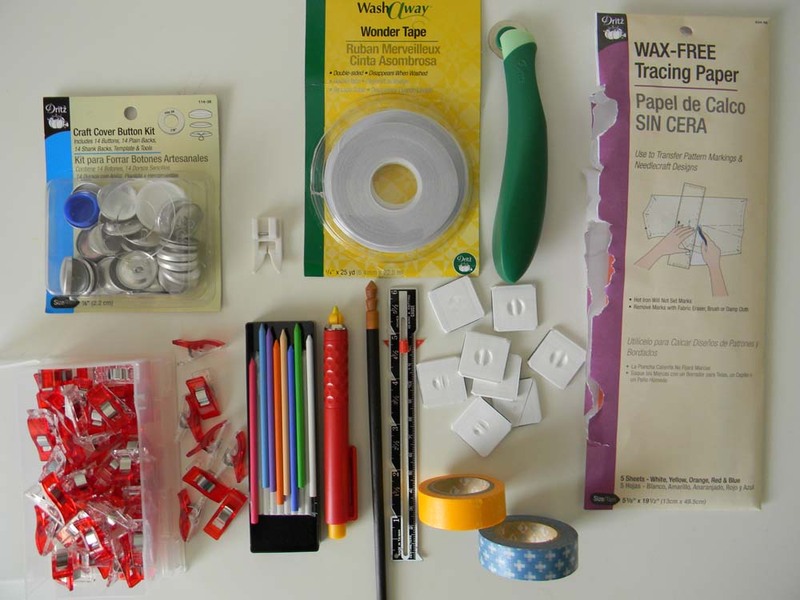 The biggest thing I learned was that sewing with the fabric is really much, much easier if you have the right tools. The slicker fabric is a little fiddly to sew, you really can't pin it without leaving holes and it can be a bit difficult to mark. But with the right tools, all of those things are easily solved. Here's all the goodies I used and each one was really important. Most are listing in Amy's PDF, but a few are my own additions. Teflon foot - It cost me $12 from my local sewing store and am beyond thrilled with the expenditure. I'd heard that you can cover your sewing plate and regular foot with painter's tape and have the same effect, but this just seemed easier. And then when you're sewing the lining (which is from regular quilting cotton), you don't have to keep pulling tape off of your machine. The foot just makes the fabric glide along. And with such long seams and such big pieces of fabric, I felt like the foot really made my machine work well with the fabric. Wonder tape - Critical for keeping my pockets in place and in the same spot on both sides since it was a step that can't be pinned or clipped into place. Smooth edge tracing wheel and wax free tracing paper - Marking the fabric to be cut using the tracing paper with the wheel was definitely time consuming at the front end. I felt like it took hours to get everything laid out and cut. But I think it was just me being nervous that I was going to mess something up before I even started and it probably didn't take as long as I thought it did at the time. Fabric weights - After cutting the fabric, there were lots of times I needed to go back and re-check something on the pattern (where to start and end a dart etc...) and laying the pattern pieces on top of my cut pieces was made much easier since I had these little weights around. My ceiling fan kept blowing the pattern pieces all over the place and it was making me bonkers so I located the weights in the bottom of my sewing tools box and I was so glad to see them. Washi tape and Chalk Cartridge - I used the Washi tape on this project over and over. Marking on the slicker fabric is sort of hard to do. I have a little Dritz chalk marker cartridge (the red thing with the box of chalk sticks) that worked really well though. I initially tried a few different chalk and fabric pencils and nothing really stayed visible for more than a few minutes except the marks from this little tool. But even with those marks, there were tiny and hard to find, so on some steps I used washi tape sort of like you would use post it flags on a document. You know the ones that say "sign here" or whatever? And when I came time to hem my sleeves and the length, I used washi tape along with my seam measurer to guide my cutting. Being 5'2, I had about a 5" hem that I ended up needing to take up at the bottom and the washi tape was a great marking tool. The Clover clips. I bought a box of 50 of them through Amazon and they were FABULOUS. 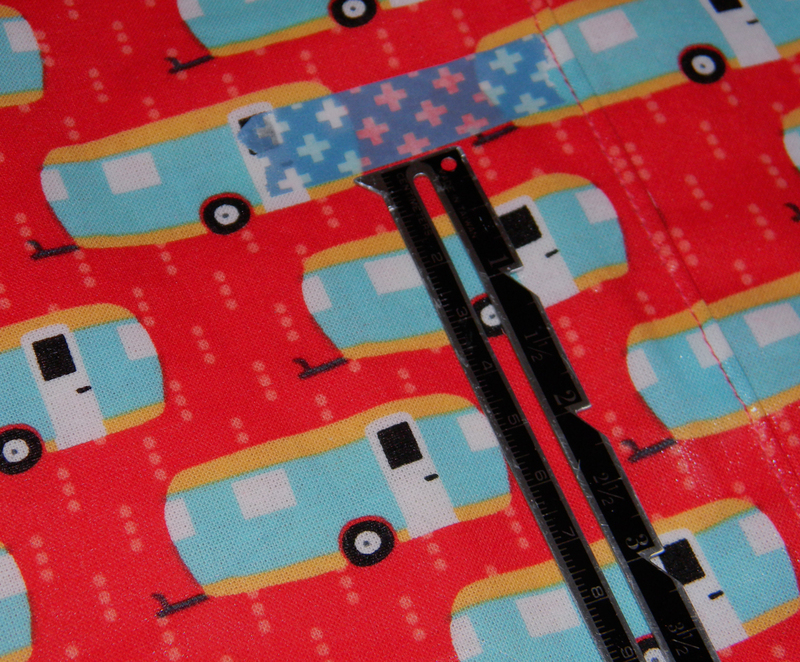 Since you can't pin the slicker fabric without putting holes in it, these clips are just perfect. I think they are sold in smaller quantities, but it was $16 really well spent. At one point I think I had all 50 attached to the coat and was so happy to have so many to work with. 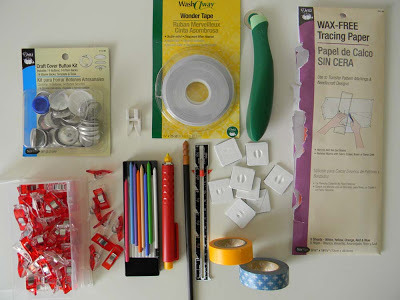 I can also see using them over and over again for quilt binding. They might just be my new favorite tool! I broke up the actual sewing of the coat over the course of a week or two so that I wasn't trying to sew when I was exhausted at the end of the day. I really just didn't want to mess it up! And at the end of it all, I ended up with a coat that I just love. The fabric is the perfect weight and it just feels great. The cut of the coat is modern and really cute. I love the way the hood drapes and its just fitted enough to be stylish, but its not constricting. I was lucky enough to get a tip from someone to make the arms bigger so they wouldn't be tight and I'm soooo glad I did that. Had I not, I don't think I would have been happy with the fit. When I got the tip to make the arms bigger, I really wasn't sure how exactly to do that (remember I'm terrible with patterns), but finally figured it out. I cut all of my pattern pieces as size = L except for the sleeve pieces which I cut as size = XXL. And then in the arm hole part of the coat pattern, I cut that at XXL as well so it would match up with the sleeve. And that was perfect for me. Just 'try on' the sleeves to figure out what size you need and then cut your fabric and mark your pieces accordingly from the beginning. And the hood actually covers my big old mop of curls without mashing them. Glad the Teflon foot worked for you and that you were able to enlarge the arms. It's really the only think about mine that makes me a little crazy and once it's done there's no going back. Beautiful work, Laurie! You made a COAT!!! Yeah! This is SUCH a helpful read! I have been admiring slickers for some time now but I'm such a stupid sewer that I just can't bring myself to try something and risk messing up a super piece of material. You've given me hope, though! I'm going to give it a bash. LOVE that print! Too fun!!! Ridiculously cute! I'd be wearing with or without rain. Love it!! It's awesome Laurie!!! Congratulations!!! I hate small hoods too - my curls don't need that encouragement to go wild either! Looks AMAZING!! I will have to make one too! As for belt loops can you just make and add some of the slicker fabric? Sorta like Jean beltloops? That is the cutest laminate fabric & I love the coat! Is this fabric already available? I'm going internet shopping. Thanks for all the tips for working with the laminated fabric. The only special supply I have never seen before is the washi tape. It looks really cool. I'm very tempted (despite my clothing sewing skills, or lack thereof) to make one too. 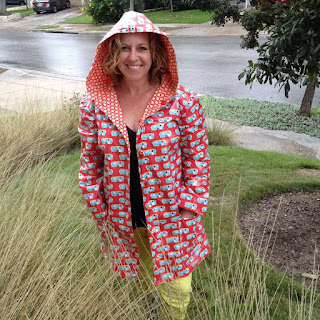 It's so hard to find cute patterned raincoats that aren't for kids (and sadly there weren't even those when I was a kid). That's amazing, I love the look of that pattern but the thought of spending all that money on laminate and getting it wrong scares me - but you might just have persuaded me. It looks fantastic on you - lets hope it rains! It's fantastic Laurie. It's so great that you pushed your abilities too. Thanks for the super informative post! Well done! 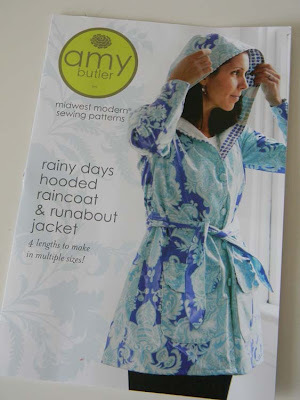 Looks amazing :) Love Amys patterns too. But I only tried bag patterns. It turned out beautiful! Congratulations! I purchased a Teflon foot but haven't got the courage to actually sew with laminates yet. Your tips will be just the thing to spur me on. Oh, and you should re-post this when the fabric comes out! 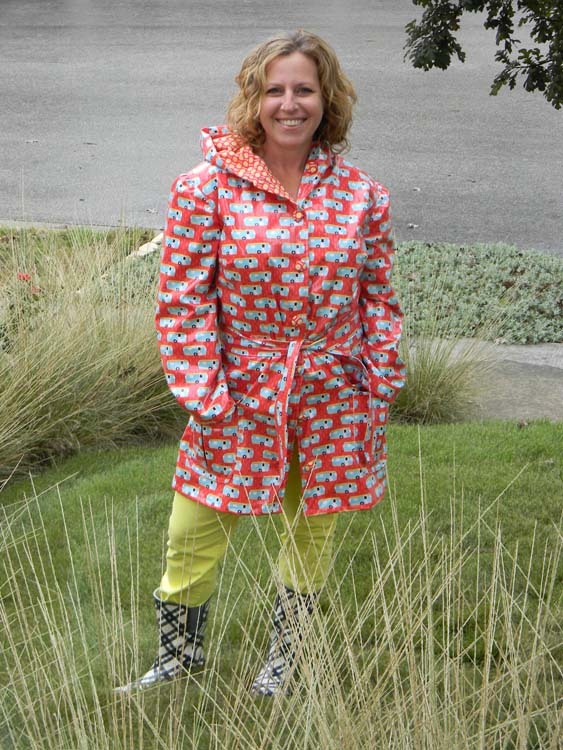 We may all be sporting your fabric when it rains! 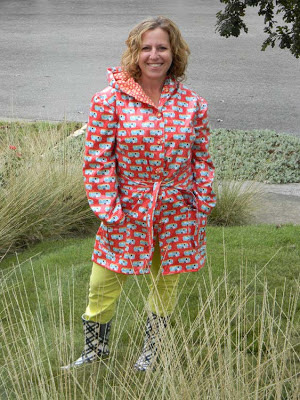 Cutest raincoat ever!! Great job Laurie! Thank you for your helpful review and tips. I've had this pattern on my "to do" list for so long. 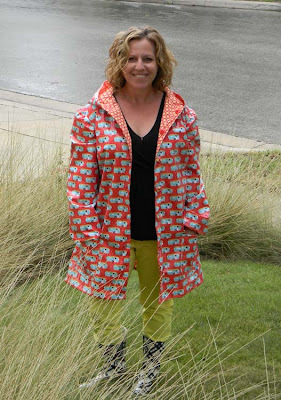 The coat is so fun in your fabric. It really looks fantastic. This is adorable--with tons of great tips! I actually had someone make one of these from AMH laminate about three years ago and get comments on it all.the.time!! But now I want one of this fabric so I might try tackling it myself!